vendredi 18 janvier 2019, par Nicole Brenez, Rita Bassil (Date de rédaction antérieure : 16 janvier 0). “ In memoriam Jocelyne Saab. Reporter, photographer, screenwriter, director, artist, and founder and Director of the Cultural Resistance International Film Festival, Jocelyne Saab (April 30,1948 – January 7, 2019) was born and raised in Beirut. Completely devoted to the destitute, to displaced peoples, to exiled fighters, to cities at war and to the poorest of the poor with no voice, her creative trajectory is closely tied to historic violence, the many ways of participating and resisting to it, as well as the awareness of necessary gestures and images in order to document, reflect on and repair it. After having worked as a journalist for her friend Etel Adnan, in 1973 Jocelyne Saab became a war reporter. Her roots in the here and now of the situation determined her practice : a rigor for factuality, pertinence and clarity, as well as rapidity in terms of making ethical and stylistic decisions. This acuteness to current affairs is systematically expressed through a deep political analysis, in advance of and resulting from her films. Jocelyne Saab’s art consists of immediately understanding which images should comprise a collective history, to make them and edit them in a way to be worthy of the historical stakes. Without Jocelyne Saab, we will lose so many necessary images to tell the history of people at war, like the shots of the Fatah while fleeing Beirut on the Atlantis (The Boat of Exile, 1982). Her work about her own country, Lebanon, shows us an exemplary and engaged visual reflection that never stopped renewing its formal aspects ; from the factual reports made possible by her fearlessness, never hesitating to adventure into enemy territory, up to the most speculative personal essay films. Suicide Commandos (1974), Middle East’s New Crusaders (1975), Lebanon in a Whirlwind (1975), War Children (1976), Beirut is No Longer Never(1976, text by Etel Adnan), Letter from Beirut (1978), Beirut, My City (1983, text by Roger Assaf), What’s going on ? (2011), One Dollar a Day (2016, about Syrian refugees), then the fiction films A Suspended Life (1984, with Juliet Berto), and Once Upon a Time : Beirut, and Story of a Star (1994, a cinephilic fable about the visual memory of a city in ruins), make up a number of panels inside a remarkable fresco within the history of cinema, painted at the extent of a life –monumental not only in relation to Lebanon, but on another level, that of the artist’s relationship to a nation. In the context of her country, Jocelyne Saab documented the terrible wounds and bruises, the divisions and contradictions, the poetry and the formidable, ever-resurging energy. We could compare this long-term endeavor of taking into account the events, but also the collective realities and the most complex sentiments, to the work that Johan Van der Keuken had made on Amsterdam or that which Wang Bing has been doing in China. Jocelyne Saab put to work her visual-political analysis in many other territories as well : Palestine (Palestinian Women, 1973, The Palestinians Keep Going, 1974), Libya (Ghaddafi, 1976), Sahara (The Sahara is Not for Sale, 1978), Iran (Iran, Utopia on the March, 1980), Vietnam (The Lady of Saigon, 1997), Turkey (Imaginary Postcards, 2016), Iraqi Kurdistan, Syria and especially Egypt, where she had often lived : Egypt, The City of the Dead (1977), Alexandria (1986), Almee Belly Dancers (1989). In 2005, she was censured and her life threatened for making Dunia, a musical about sexual pleasure in the context of Islam, filmed in Cairo. Jocelyne Saab had recently published her first album of photos, Zones de guerre (2018) with Les Éditions de l’Œil, accompanied with texts by loyal friends from her youth, Etel Adnan and Elias Sanbar, and produced by the generous Jean-Luc Godard. In addition, she wrote a preface for the first volume of the still unpublished Complete Works of Jean Epstein, expected soon. Jocelyne Saab was preparing a new film about and with May Shigenobu (the daughter of Fusako Shigenobu), as well as a book of memoirs. The Cinémathèque Française, of which she was a member and depositor, dedicated a retrospective to her work in March-April 2013. © Nicole Brenez (source FB), translated by Bani Khoshnoudi. 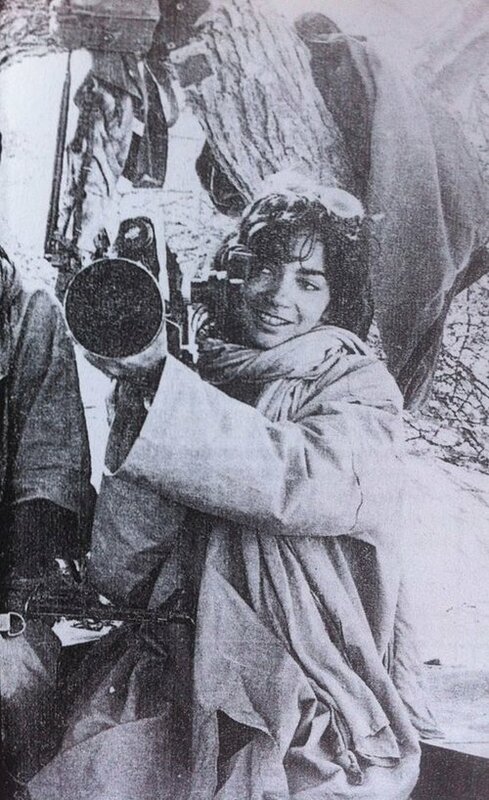 L’article d’hommage à l’œuvre de Jocelyne Saab par Nicole Brenez dans le site de la cinémathèque française est la nécrologie de référence de la présente traduction en anglais. En entête une capture d’écran de l’ITW de Jocelyne Saab pour BBC Arabic en 2016. https://youtu.be/2r0WREG0kek.